My name is Heather Musingo and I am a hobby artist raised in rural northern Pennsylvania and recently transplanted to southwest Florida (Follow me on Instagram!). I was always interested in art, as indicated by the many items my mother kept when I was growing up. I never got much more instruction in art than the occasional elective class in secondary school. When it came time to choose a major for college I seriously thought about art, but I knew that my student loans would be hard pressed to be paid with that degree. I opted for my second love, biological science, and became a secondary school teacher. Teaching occupied my life for about 15 years and my art was reduced to creating bulletin boards and the occasional class project – when the curriculum would allow. Fast forward to May of last year, when I stumbled upon my first Instagram art challenge (hosted by Rachelle Doorly) while looking for something creative to do with my two boys, whom I was then homeschooling. I picked up three sets of cheap Crayola watercolors and spiral bound sketchbooks for us to play with, and thus began my journey back to my creative self. I had never used watercolors as an adult so this was a completely new experience. It didn’t take long for me to realize that this might, in fact, be my medium. I jumped in with both feet and completed every single prompt for two months straight. My boys, on the other hand do not share their mother’s interest in art and soon gave up. I was amazed at the progress I was making just by practicing every day. I soon ran out of room in my little sketchbook and bought another one, this time with heavier paper. What a difference the paper made! The techniques that I’d seen on the feeds of other Instagram artists were starting to work for me. I soon needed to upgrade from my basic 12 color Crayola set and picked up a Togood watercolor set with 24 colors and a few new brushes. I also grabbed a Master’s Touch set with 12 tubes of paint that, honestly, I haven’t even opened yet because I still find it daunting. 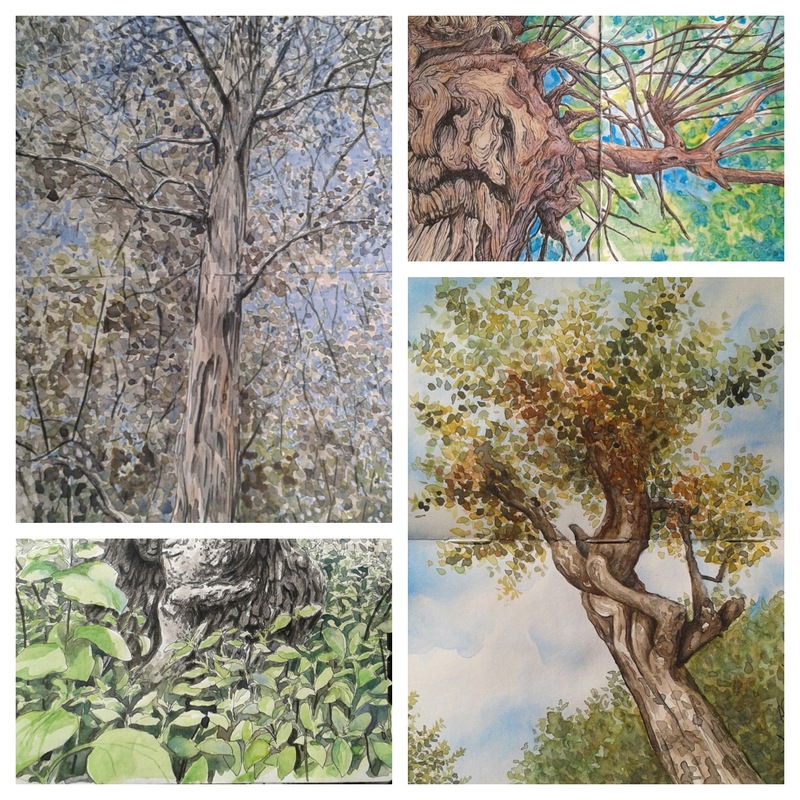 I still paint and sketch several times a week in my sketchbooks, although with a busier schedule it has slipped from the daily practice I was getting last year. I have started working on 140 lb. Canson paper in larger sizes for special projects, but most of my work is still in 7” x 10” sketchbooks. I latched on to several other art challenges as the months went by, finding Charlie’s Doodlewash feed on Instagram in the process, and found that following a list of daily prompts (whether I could complete all of them or not) is a great way to practice painting and grow my skills. I tend to twist the prompts to fit my interests, which still fall under the category of nature and the biological sciences. I brainstorm for ideas, then search through pages of google images until I find just what I’m looking for as a photo reference. A quick pencil sketch followed occasionally by a more detailed ink drawing with Pigma Micron pens and then the image comes to life with color. In the beginning, I had a very difficult time waiting for the paper to dry in between layers. I have since learned how to be more patient and multitask my art with other activities. I was stunned when my list of Instagram followers reached 100 and continue to be amazed as that number grows. All of these people want to look at MY art??!! When Charlie contacted me to be a guest artist I got a bit choked up, especially after looking at most of the other artists he has featured. I am truly honored. Thank you, Charlie, for seeing my art as worthy. Heather, your artwork is beautiful, and I agree that watercolor is your medium. Your critters have such personality. I love your paintings of sea life and animals. I like your story and your art is wonderful,thank you for sharing.